Supplement water heating or chilling. 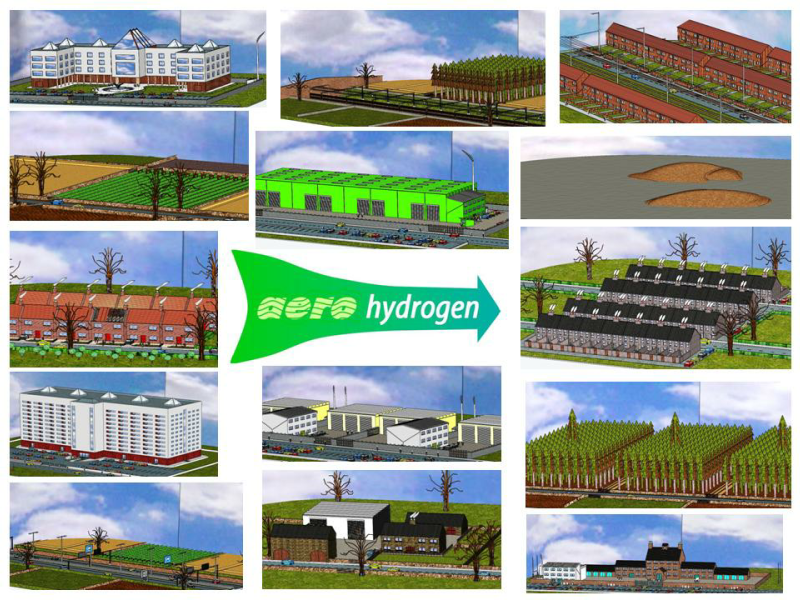 Contribute to grid manufacturing of AeroHydrogen-methanol. 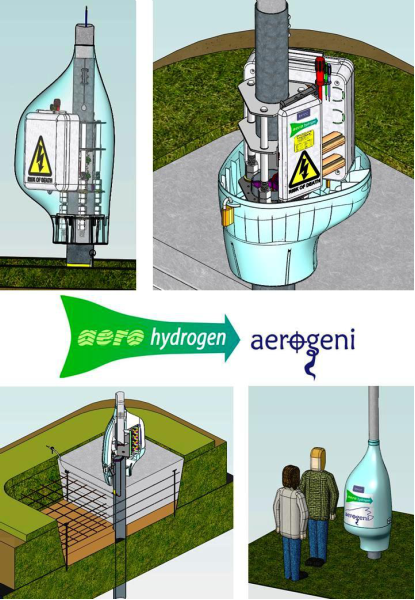 The AeroGeni is a vertical axis scaleable turbine. The Flowah is a sequencable unscaleable horizontal axis turbine. The Solbrero is a plug-in solar cell module for both turbines. High yield means economic viability, crossing the worthwhile-to-implement-threshold - even from a purely economic viewpoint. Trucks, aeroplanes etc will always need a fuel source. 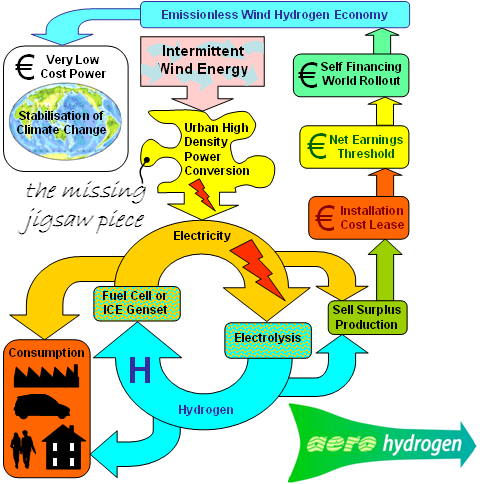 Using excess capacity of electricity during high yield periods allows production of hydrogen. From hydrogen we can derive methanol, a fuel that is eay to handle and distribute. 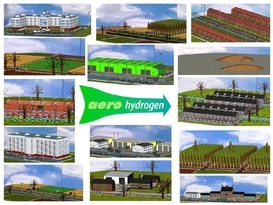 AeroHydrogen is sustainable fuel manufacture. Are we using the right technique and materials to capture wind? Or are we trying to eat soup with a fork? The 100 page AeroHydrogen report and CAD detail of the three device remains and is waiting to be applied. As an inventor of carbon reducing technology, building my first turbine in 1986, I am amazed how difficult it is to get these projects funded. Want to research the effects of climate change? Plenty of funding. Have a solution? Very difficult to get funding. We need to move away from talking and watching to doing and building. Obviously it was disappointing not to start building these devices in 2007. You have to wonder what other solutions are not getting funded. UK department of innovation was offered this project in 2007. Since then we have had wars for oil, with thousands dying, billions of tonnes of CO2 created and irreplaceable oil wasted and €billions spent building low yield wind turbines. It all seems criminally negligent and I am pursing a legal case against NESTA. I still hope to build the Aerogeni and Flowah one day. Click to enlarge image. Clockwise: Emplacement, AeroHydrogen diagram, Scenes from 2008 AeroHydrogen Paper, right way to eat soup?, malnourishment, first turbine 1986. Logos; Solbrero, AeroGeni, Flowah.